The pad is drained of excess solution, and then applied in an overlapping circular motion. 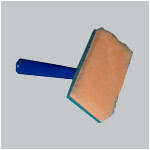 The Feather Duster with a telescoping pole, is ideal for wiping the wall surface while spraying patina solution. A low pressure Garden Sprayer applies patina solution and patina wash to the wall as a fine mist. The feather duster, used simultaneously catches any drips. 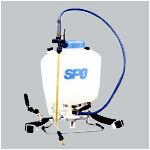 Sprayer pressures range from 40-150 psi. 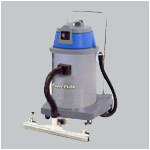 The garden sprayer is also used to apply Patina to the slab surface. 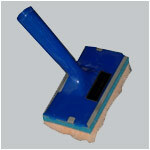 A Rotary Polisher and Wet-Dry Vacuum are required to prep and finish the patina application.